C2's premiere product blends leading-edge technology and rare, artist-grade pigments to create extraordinary color with exceptional vibrancy, coverage and a lustrous, refined hand. It’s this dynamic blend of artisanship and innovation that allows our full-spectrum colors to achieve a luminosity and vibrancy that is unmatched in the industry. L7000 Interior Latex Flat is a smooth, beautiful broad wall finish for low abuse areas where no sheen is desired. This product is designed for interior walls and ceilings where it helps to hide surface defects. Unsurpassed application properties give all C2 LUXE products a refined hand, a smooth beautiful finish — at once elegant and durable. C2 Luxe Gloss is a premium 100% Acrylic coating designed to provide exceptional hiding, adhesion, and washability on interior surfaces. Unsurpassed application properties give all C2 LUXE products a refined hand, a smooth beautiful finish at once elegant and durable. L7100 Interior Latex Matte is a broad wall finish with a sophisticated subtle luster. This product is designed for bedrooms, hallways, and other living spaces, and is characterized by exceptional hiding, adhesion, and washability. Unsurpassed application properties give all C2 LUXE products a refined hand, a smooth beautiful finish — at once elegant and durable. L7300 Interior Latex Satin is a trim and wall finish for high-maintenance areas such as bathrooms and kitchens. Characterized by exceptional hiding properties, stain resistance, washability, and flow and leveling. Unsurpassed application properties give all C2 LUXE products a refined hand and a smooth beautiful finish — at once elegant and durable. L7400 Interior Latex Semi-Gloss is primarily used as a trim finish where maximum durability is desired. Characterized by excellent stain-resistance and flow and leveling, this product is ideal for bathrooms and kitchens. Unsurpassed application properties give all C2 LUXE products a refined hand and a smooth beautiful finish — at once elegant and durable. C2 Studio is another way to enjoy our premium products at a price that’s wallet-friendly. Think of it as an affordable luxury. C2000 Latex Non-Reflective Flat is a premium low-VOC coating designed to provide an exceptional non-reflective finish on interior walls and particularly the fifth wall, the ceiling. C2300 Interior Latex Satin is designed for high-maintenance areas such as kitchens and bathrooms. C2300 is exhibits outstanding hiding properties, stain resistance, and washability. C2400 Interior Latex Semi-Gloss is designed for application in high traffic areas or trim work. C2400 is exhibits outstanding hiding, stain resistance, washability and flow and leveling. Our revolutionary Cabinet and Trim Paint features patented Polywhey® technology — a safe, easy-to-use finish using recycled dairy whey protein. This innovative formula blends the elegance of an Old World traditional oil-based paint with the benefits of modern-day, low-VOC technology. The result is a smooth, porcelain-hard finish that is one of the most eco-friendly and durable products we have ever created. Because of it's incredible durability, it’s also great for use on floors. Our revolutionary Cabinet & Trim Satin combines C2 Paint with patented PolyWhey® technology — a safe, easy-to-use finish using recycled dairy whey protein. This innovative formula blends the elegance of an "Old World" traditional oil-based paint with the benefits of modern-day, low-VOC technology. The result is a smooth, porcelain-hard finish that is one of the most eco-friendly and durable products we have ever created. In fact, its so durable it’s also great for use on floors. Our revolutionary Cabinet & Trim Semi-Gloss combines C2 Paint with patented PolyWhey® technology — a safe, easy-to-use finish using recycled dairy whey protein. This innovative formula blends the elegance of an "Old World" traditional oil-based paint with the benefits of modern-day, low-VOC technology. The result is a smooth, porcelain-hard finish that is one of the most eco-friendly and durable products we have ever created. In fact, its so durable it’s also great for use on floors. C2 Premium Exterior Paint - The beauty of full spectrum color, combined with the durability to withstand the elements. C5200 Exterior Latex Eggshell is a 100% Acrylic formulation designed for application to most exterior surfaces where a slight angular sheen is desired. C5200 is specifically formulated to provide outstanding covering power, excellent flow and leveling, tenacious adhesion and weathering characteristics, like gloss and color retention, that are second to none. C5100 Exterior Latex Flat is a 100% Acrylic formulation designed to be applied to most exterior surfaces and specifically formulated to provide outstanding covering power, tenacious adhesion, excellent weathering capabilities and color retention. C5100 is an excellent choice to protect vertical wood siding while showing the texture of the wood. C5300 Exterior Direct to Substrate is a 100% Acrylic formulation, designed to be applied to most exterior surfaces without a primer. The C5300 series is specifically formulated to provide outstanding covering power, tenacious adhesion, excellent stain resistance, superior weathering capabilities and great color retention. The C5300 series is a great choice for both aluminum and vinyl siding. C5400 Exterior Latex Semi-Gloss is a 100% Acrylic formulation designed for application to most exterior surfaces where a semi-gloss finish is desired. C5400 is specifically formulated to provide outstanding covering power, exceptional flow and leveling, tenacious adhesion and weathering characteristics, like gloss and color retention, that are second to none. C2 Paint Guard Fusion is now featured as the #4 Best New Building Product on This Old House! This water-based coating not only waterproofs wood for up to 10 years, it contains pigments that add color and UV protection and a polyurethane that leaves an attractive, abrasion-resistant sheen. What’s so special about C2 Guard and how does it work? Using C2 Guard is like putting a protective layer of bark back onto a piece of dressed lumber, thereby protecting and fortifying it from elements like water. The particle size of commonly used waterproofing and stain products is too large to penetrate the surface of most woods, even softwoods, but especially very dense hardwoods. Other stains and wood preservatives essentially sit on the surface, providing little more than a temporary topical barrier protection. C2 Guard breaks the surface tension and allows the nano particles to fall through the surface, deep into the pore structure of wood, filling up hollowed cell walls that exist at the deepest levels. Once absorbed, a bond occurs, forming a flexible co-polymer barrier from within the substrate that becomes part of the ongoing cellular structure. This barrier stops water intrusion completely, yet allows moisture and vapors to escape, preventing the effects of mold and mildew, dry rot, cracking, peeling and cupping of wood. What is nanoparticle technology and why does C2 Guard employ this technology? Unlike today’s market leaders, C2 Guard’s base materials are newly developed, environmentally stable and safe polymers. When examined under a microscope, these materials are much smaller and lighter than those of today’s market leaders. In fact, a nanometer is 1,000ths of a micron, 1/39,000,00 of an inch. Consequently, when applied to wood or concrete surfaces, C2 Guard’s nanoparticles penetrate the external surface more deeply, thereby sealing and protecting the surface for a longer period of time. C2 Guard’s technology works like no other product on the market today. Why should I use C2 Guard versus other products on the market? C2 Guard is unique in that it breaks the surface tension and allows nanoparticle polymers to absorb deep within the wood, creating a barrier that becomes part of the cellular structure of the wood. This barrier stops water intrusion for up to 6 years on horizontal surfaces (like decks) and 10 years on vertical surfaces (like fences and siding). Most common sealer and water proofers on the market today are water-repelling stains and contain preservatives made of oil, paraffin wax and silicates. When applied, they create a hardened shell or surface condition that helps prevent moisture absorption. However, these products merely sit on the surface of the wood and, once they break down—from varying weather or other caustic conditions—they no longer repel moisture. Water will be absorbed, subsequently destabilizing the wood, and the cycle of deterioration begins with mold, mildew, dry rot, cracking, peeling and cupping of the wood. C2 Guard eliminates the need to reapply a waterproofing product every year or two. Current stain and waterproofing systems are high maintenance, requiring frequent re-application every year or so, and the results are the same regardless of the product used. 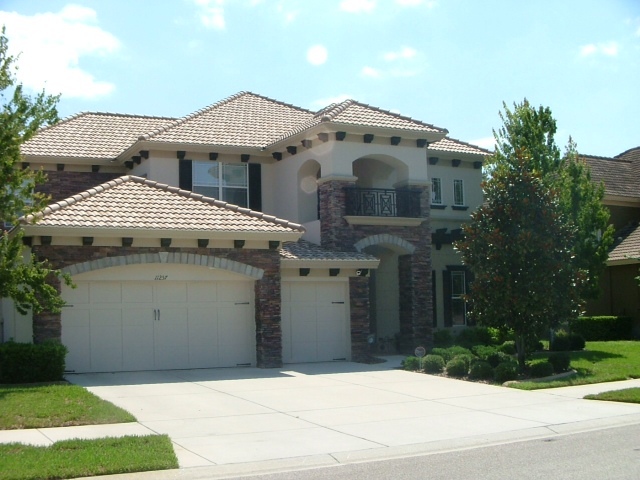 These reapplications are costly in terms of both product and labor costs, whether you are doing it yourself or employing a professional tradesman to do it for you. Use C2 Guard to protect your investment from the start. 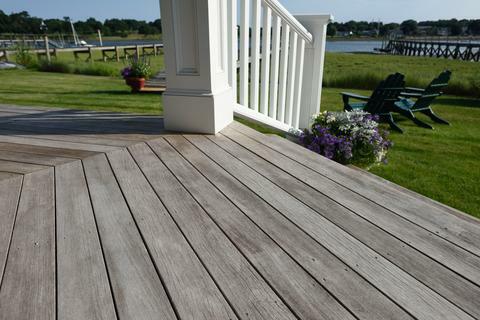 There’s no need to replace current wood with composite decking. Your original investment in the beauty of natural wood, with its endless variation, nuances, textural and visual feel, was a good decision. 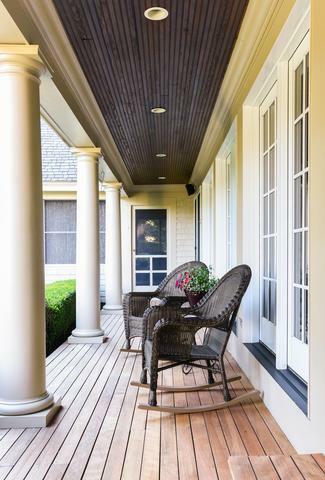 C2 Guard provides an easy, effective and long-lasting maintenance program that both protects the investment value of your beautiful wood and provides the visual aesthetic you understandably want to have. Exotic woods, such as IPE, mahogany, teak, kayu are problematic to maintain, as the traditional oils used to rejuvenate them require maintenance coats year after year. C2 Guard is as equally effective on the hardest and densest hardwoods as it is on softer woods such as cedar, redwood, pine and fir. The combination of polymers in C2 Guard soak deeply into the wood fiber and form the same flexible, water-shedding membrane from within the wood. C2 Guard will work on most hard and soft woods. How do I get the most for my money when applying a waterproofer? 1. Assure the surface is free of algae, mold, mildew, etc. 2. Assure the surface is ready to accept a waterproofing substance. 3. Apply when temperature is over 35° and air is dry, with no imminent rain. 4. Apply the waterproofer on a surface until it rejects further treatment. That is, apply the waterproofer until it stops soaking in. Older porous wood may accept three applications before the surface voids fill up. You do not need to wait until your first application has dried. Continue to apply product while the surface is damp. How safe is C2 Guard? Is it toxic? C2 Guard has been tested for acute toxicity by Huther Associates, a nationally known environment testing organization. The test species used were fish and shrimp larvae, as they are 1,000 times more susceptible to toxicity than a 6-inch goldfish. During application, tests were conducted in liquid form, the results: No toxicity was found. Also, when materials treated with C2 Guard were immersed in fresh or salt water, they did not leach out or become hydrolytically unstable. These are some of the reasons the State of New Hampshire supports use of this product throughout the state. C2 Guard contains no toxins and emits low to no odor. It does not contain nitrates or phosphorous compounds, aluminum, arsenic, barium, cadmium, chromium, copper, lead, mercury or other heavy metals or silica. There is an internal chemistry that is designed to facilitate bonding to wood and cementations substrates. Plants and vegetation are not affected by C2 Guard application. Why is it recommended to wait up to 6 months before waterproofing a pressure-treated lumber surface? Market leaders recommend waterproofing of pressure treated lumber as soon as 3 months. As you know pressure-treated lumber is heavily treated with chemicals and other materials when it is manufactured. Also, pressure-treated lumber is very dense. Because of these two factors, pressure-treated lumber is usually not ready to accept a waterproofing treatment for at least 3 months. However, the consumer following the advice given by the market leaders buys the product and takes the time to apply it. Because the pressure-treated lumber has not dried out enough, it accepts a limited amount of the application, which washes away relatively quickly. The consumer continuing to follow the instructions waits one to two years before the next application. During that period, the wood dries, splits, cracks or warps because it has inadequate waterproofing protection. So when should a sub-micron waterproofer be applied to a pressure-treated surface? Timing of application depends upon at least two factors: One is the weather. If you live in New England, your wood surface is covered in snow for much of December through March. If you live in a southern state, your pressure-treated lumber is subjected to constant sunlight. Therefore, the elements play a key role in applying a sub-micron waterproofer. The second factor is the readiness of the pressure-treated lumber to accept a sub-micron waterproofer treatment. The best way to test for readiness is to purposefully spill water on the surface to be treated. If it readily soaks in, the surface is ready. If it sits on the surface in a puddle or pool and does not soak in, it is not ready to be treated. Is C2 Guard a silicone, latex or acrylic? C2 Guard is none of the above. C2 Guard is a deep-penetrating, complex co-polymer. Competitive products are primarily surface treatments. Basically, it tells us to test our surfaces before deciding the best treatment. Lets say you last sealed a surface one year ago. The surface looks dry or is cracking, splitting or warping. If you spill water on that surface and it immediately soaks in, the surface is telling you it needs additional waterproofing. If you notice after a rainstorm that the rainwater is soaking into the wood, then additional waterproofing is necessary. On the other hand, if you spill water on a wood surface and it runs off the surface, then waterproofing is unnecessary, and as previously mentioned, even wasteful. The same examples are true of concrete surfaces. If moisture is readily accepted into the substrate, then the concrete is ready to accept waterproofing. Does C2 Guard prevent mold and mildew on wood, composite decking and concrete? Wood, composite decking or concrete that has been saturated with water over time collects dirt and develops mold and mildew. C2 Guard stops the production of mold and mildew on wood, composite decking and concrete. Scrub the affected area with a cleaning mixture and a scrub brush and rinse with a garden hose or pressure washer no more than 1250-psi using wide fan pattern. Leave solution on concrete for 15 to 20 minutes. You can reapply if needed. Once substrate is dry and clean, apply two coats of C2 Guard, wet on damp (do not allow to dry between coats). 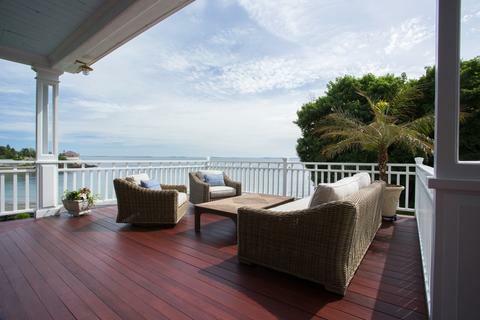 You should apply three coats if the wood, composite decking or concrete is aged and very porous. Results: The mold and mildew has undoubtedly penetrated the wood, composite decking or concrete and will continue to come to the surface for some time. C2 Guard allows water vapor transmission to occur, thus allowing the trapped moisture to rise to the surface. Apply another solution of water/bleach/detergent and wash mold away. Continue this until mold/mildew is gone. Do not reapply C2 Guard. No additional water will be able to penetrate from the surface because the wood, composite decking or concrete is now protected by C2 Guard. In time, the mold and mildew will dry up. This process could take several months to occur. Can C2 Guard prevent airborne mold? C2 Guard cannot prevent airborne mold. But what it will do is prevent the mold from attaching itself to the wood and concrete because there is not enough dirt and moisture present to allow the mold or mildew to anchor itself. The mold cannot survive and it will gray as it decomposes and will be easy to remove. What does "beading" really mean? The Beading Myth: The more beading you see, the better your wood surface is waterproofed and protected. The truth is that more beading indicates the applied product is sitting on top of the surface and probably contains a significant amount of wax. It tells you it has not permeated deeply. That is why all leading brands of clear waterproofers suggest you reapply every year. These products do not penetrate the surface and are washed away by the elements and/or bleached out by the sun. What does "two coats, wet on damp" mean? 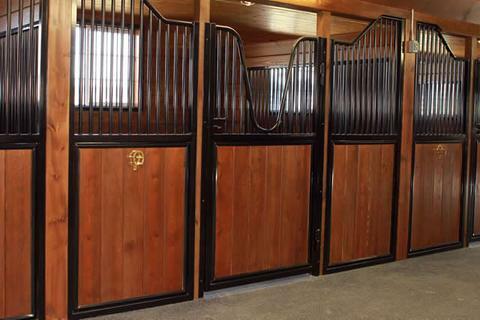 Wet on damp means to apply a liberal, uniform coat onto the wood substrate, and then within 10 to 15 minutes, return to that section and apply a second coat while the C2 Guard is still slightly wet or damp. This is recommended for three reasons: First and foremost, this type of application ensures that the maximum amount of nanoparticle polymers penetrate deep into the cellular structure of the wood and provides the water-shedding benefit you want to achieve. Second, it insures there are absolutely no “misses” in your application; you require total coverage for the product to perform at its expected high-functioning level. Third, when applying tinted C2 Guard for wood, by adding a stain color, the wet-on-damp application allows you to have a more even distribution of the color across the substrate. Will C2 Guard for Wood, tinted to a color, fade like other stains? The simple answer to this is yes. However, it will retain its color remarkably well compared to most all other stains for the following reasons: C2 Guard employs an incredibly fine-grind European tint system, along with trans oxides, all formulated to maximize fade resistance. Superior color retention is one of the biggest attributes of C2 Guard, but everything fades under the sun, even automotive finishes. Those substrates with greater exposure to the sun will fade faster, such as the south and west faces of buildings and fencing, as well as fully exposed decks and the like. Substrates protected from the harmful UV rays of the sun will retain their color for extended periods—years, even decades. The advantage of the C2 Guard program is the ease with which re-coat of faded surfaces can be accomplished. Simply give the surface a bio-wash clean, utilizing All Wood Cleaner (alternately, a careful power washing is very effective) and brush, pad or spray on another coat of C2 Guard with Stain. Since C2 Guard will never peel, there’s no need for time-consuming sanding and scraping. Always consult your C2 Guard dealer for detailed instructions on the easy maintenance and re-coat of C2 Guard with Stain for Wood. I like the color of wood "as-is." Will C2 Guard in clear maintain this color? In all likelihood, the answer to this is a qualified no. The natural tannins in woods, such as cedar, fir, redwood and mahogany are what give these woods their natural, beautiful color. Many people understandably wish to retain this without further adulteration. The problem is that these natural tannins lack light and UV stability. They very quickly lose their natural color pigmentation when exposed to sunlight. Therefore, we need to give the sun something to work on—stains that are more concentrated and light-fast pigments. These will not arrest fading, but will keep your surface looking better longer, extending re-coat cycles. Consult your C2 Guard dealer for specifics relating to your project. How soon after rainfall or pressure washing can I apply C2 Guard? Wood should be dry, though some degree of dampness is acceptable, depending on desired application methods. In a typical application, the wood should be surface dry for at least two hours for best results. Generally, you can power wash your substrate early in the morning and stain by noon. If rainfall is imminent, you should stop the application and protect your recently finished work. If you are applying in sunny conditions as opposed to shade (shade is always preferred), we recommend that you lightly mist the substrate with water, let the wood fibers recover for 10 to 30 minutes, then apply two coats of Guard, wet on damp. Always consult your local C2 Guard dealer for detailed application instructions. Can I apply C2 Guard in full sun? It is always recommended to apply this type of product in the shade. By planning your work, it is generally possible to stay in shade. However, if this is not possible, mist the substrate with water, let the wood fibers recover for 10 to 30 minutes (the surface of the wood should be just dry), then continue to apply C2 Guard. How do I prepare wood to properly apply C2 Guard? Please refer to the C2 Guard product specification sheet on this site. There are many situations and permutations when dealing with both new work and re-coat or retrofit work. Always contact your local C2 Guard dealer for full preparation and application instructions. How often will I have to re-coat with C2 Guard? There are two separate and distinct parts to the answer to this question. The first part is preservation of the wood itself, and the second part is the visual aesthetic you want to create and maintain. C2 Guard for Wood is designed first and foremost as a wood stabilizer and preserver. It accomplishes this through its combination of nanoparticle polymers that penetrate deeply into the surface and provide a remarkably long-lasting, water-shedding barrier, eliminating the single biggest enemy of all exterior woods—water. Therefore, from the standpoint of preservation of your investment in the wood, you will not have to re-coat C2 Guard for at least 6 years on horizontal surfaces and 10 years on vertical surfaces. Regarding aesthetic issues, such as fading, rub-off or other disfiguration due to use or exposure, the solution is often to touch up or blend in a small amount of additional material onto the affected areas only. Resist reapplying to the entire substrate until the level of deterioration is widespread and an entire refresher coat is needed. The fact that you will eventually have to re-coat your stained area is inevitable. The significant benefit of the C2 Guard program is that Guard will never peel, and you will not have to scrape and sand new work; merely clean and re-coat. Where can I use C2 Guard? Does C2 Guard have color or does it have a clear coat? C2 Guard is available in clear. There are semi-transparent stains available for tinting. Please see our website for a list and color charts of wood stains. Can I use C2 Guard on composite decking and will it help eliminate mold and mildew problems? Yes, C2 Guard will penetrate composite-type products and create a water-shedding condition. Clean surface molds before application. Mold will continue to migrate up through the C2 Guard and onto the surface, where it can be cleaned off. This may happen several times before all mold and mildew are expunged from the substrate. Because mold requires moisture to survive, C2 Guard cuts off its lifeline and the mold or mildew issue is solved. Can I use C2 Guard on my boat and/or deck? C2 Guard is the perfect product for use on boats, decks and any other wood structures that are exposed to the elements. It’s approved safe for use over fresh and saltwater. When C2 Guard dries on a substrate, it does not leach out or become hydrolytic-ally unstable; however, it may be removed by wearing the substrate away or by application of strong oxidizers. C2 Guard is approved by the State of N.H. Department of Environmental Services (DES) for use over water. Marine formulas for wood and concrete and masonry applications are available. Can I paint on top of C2 Guard? After treating raw wood with C2 Guard, simply prime and paint as usual. C2 Guard is non–film-forming and will not affect the wood surface.